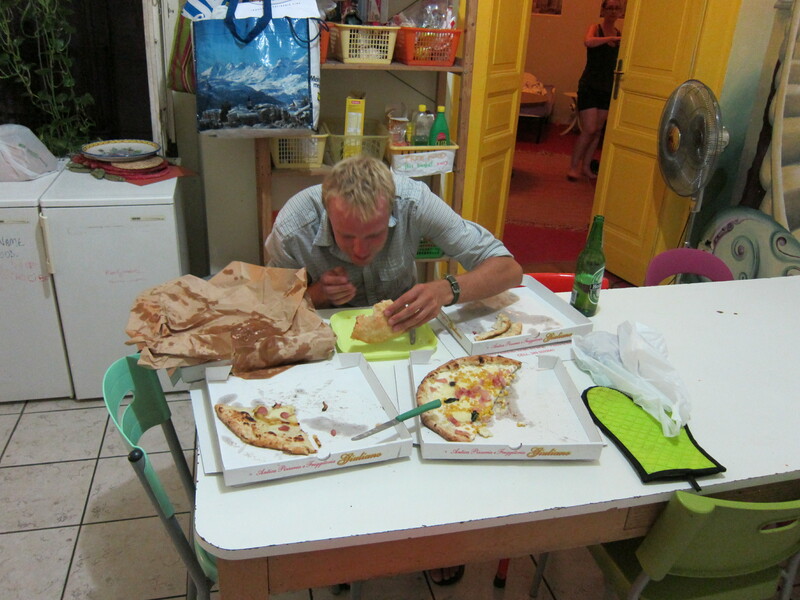 As I write this [in mid-July: I’m a little behind on publishing blog posts, I’m afraid], I have just completed more than my fair share (half, since there are two of us) of the four pizzas we ordered for dinner in Naples. So you’ll have to excuse me if it’s a bit of a slow post. Right now my digestive system is doing a lot more than my … whatever the thinking system is called. We’ve been in Naples since Saturday night, and as I write this it’s now Wednesday night. So that’s … Saturday, Sunday, Monday, Tuesday, Wednesday … five nights’ worth of dinners. And there were a couple of lunches in there too. Over the last (Google search for five times twenty-four – no, wait, four times twenty-four) ninety-six hours, I’ve averaged more than two pizzas a day. And on average, it’s probably cost about four euro per pizza, or less. Ok, so it’s not the most elegant photo ever. But then, it wasn’t particularly elegant if you were there, either. Honesty is important in a travel diary, after all. So, you’d think my lasting take-away from Italy would be pizza. (“Take-away”, get it? Terrible joke, I know, but like I said, not a lot of blood to the brain right now.) But no, I think it’s the coffee that takes the metaphorically mixed cake. Eighty euro cents for an awesome espresso from pretty much any random place that you walk past – how could I say no? In fact, how could I not say yes multiple times within the space of an hour or two? We’re going to Croatia after Italy, so I’m hard pressed to complain about how deprived we’re going to be in any regard. But brilliant four euro pizzas and tasty eighty euro cent coffees will be sorely missed by my taste buds, if not by everything from there on down. This entry was posted in Food and drink, Travel and tagged italy by Sam Roberton. Bookmark the permalink.